As you know, the Nordstrom Anniversary Sale is raging on — prices go back up on August 6! There are still a ton of great items left, so I thought I’d take a swing through the sale and see what some of the top-selling workwear is. Readers, have you gotten any of these pieces to work to work? What are you keeping and what are you throwing back? 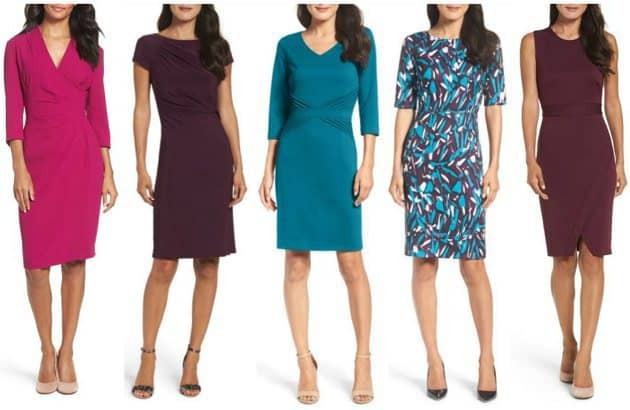 (You can find all of our workwear picks from the 2017 Nordstrom Anniversary Sale here, including my picks for dresses (SO MANY still in stock; great options) and for shoes for work. Updated 8/3! Anything that only has a few sizes left or that seemed to be restocked while I was doing the post has been marked with an asterisk — if you like it, you may want to move fast! I am NOT sure which top you are refering to, but that is TERRIBLE. We have enough issue’s with men stareing at our boobies without us haveing to deal with clotheing that onley ENCOURAGES them to act like animals with base instincts that are counter productive and NOT helpful to our being abel to establish lasting relationships with them. I know that even today, when I walk along 3rd avenue in the 60’s there are a couple of places I can count on men whisteling at me, clicking their tongues and making funny noises that they think will make me think more of them s-xeueally. FOOEY! Why do they think those sounds will be alluring to us women? They have the OPOSITE affect. So haveing clotheing that does the same thing is NOT something that we, as women and members of the HIVE should support. I say DOUBEL FOOEY to see through peplum tops. FOOEY! I like the Halogen merino wool cards but one of the three colors I ordered has a hole already. I’d cut the tags so I’m not returning and just buying a replacement. I know N would replace but I don’t have time. – Ellen Tracy teal dress: Neckline was odd – kind of a middle height that made me, with a bust, look frumpy; also thought the arrows actually made my waist look wider, because of their bulk, which was clearly not the intent. – Ellen Tracy print dress: this I liked more – fit well, although the raglan cut on the shoulder made my chest look bulkier, which … no, thank you. If I hadn’t tried the print version of the Eliza J dress in the second line (royal blue), which I liked better, I would have kept this one. -Burgundy Maggy London: This was an unusually heavy ponte for them, and I felt like the neckline was strangling me. ALso the waist-hip ratio of the cut was more extreme than they usually have. I felt like the dress required a small bust, tiny waist, and then large hips for the proportions to work as cut. – Black Tahari- I didn’t buy this, but a tall apple coworker did and it looks great on her – gives her more of an hourglass shape than her usual clothes. -Burgundy Tahari: My boss, who is petite and curvy, bought this dress last year and I always admire it on her, but I feel like the neckline does not work for me. It’s too high and too low. -Royal Blue Eliza J with twist waist: Bought this in both the royal blue and print teal colors; the print teal runs a little larger in the same size, I think. I found the print to be more flattering (maybe because of slight size difference, so I kept that). 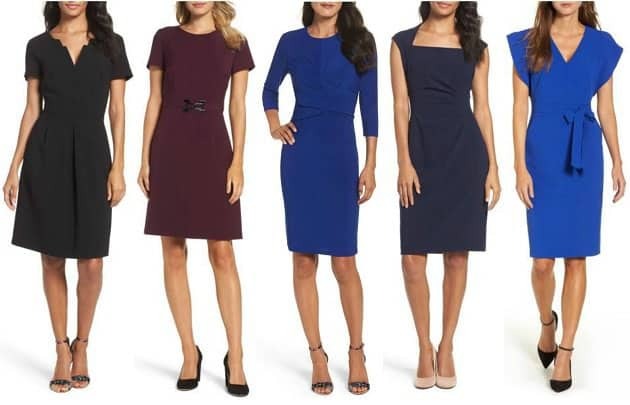 -Royal Blue Eliza J with wings: I am normally a 10 in this brand, and both the black and blue in this dress ran small/tight in the hips compared to other dresses they make. I considered going up to the 12, but found other dresses I liked. If you’re at all between sizes, I would size up. -Vince Camuto pink drape top – probably works better for a small/medium bust. I needed a medium for my bust, but that was WAY too much fabric elsewhere. Also somewhat see-through. -Halogen White poplin top was see-through; did not get blue, which might be better. I bought the Ruffle Sleeve Sheath Dress (Eliza J) in blue and I love it. I’m 5’9 and in between a size 12 and 14. I ordered the 14 and it fits perfectly. I wore it yesterday for the first time and got compliments all day. I’m considering buying it in black too!